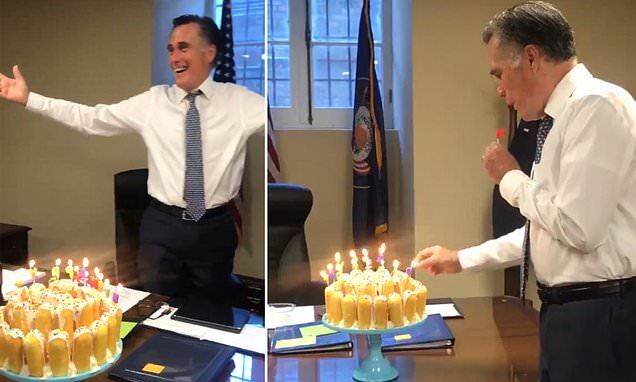 US senator for Utah Mitt Romney took his time blowing out every candle individually on a surprise birthday cake made from his 'favorite snack,' from his staff on Tuesday. Romney, 72, tweeted a video of the presentation of an array of Twinkies displayed on a cake platter, as his staff could be heard singing him the birthday song. 'These are all wishes I'm getting, all these wishes,' Romney joked, as he plucked each candle from the display to blow it out. 'My team surprised me with a cake made out of my favorite snack—twinkies!' Romney wrote while sharing the video. The clip starts with a member of Romney's staff walking into his office with a platter stacked full of Twinkies. Romney is clearly surprised by the kind gesture, as he smiles wide at the sight of the snack.